Want to be notified of new releases in Ice3man543/MalScan? 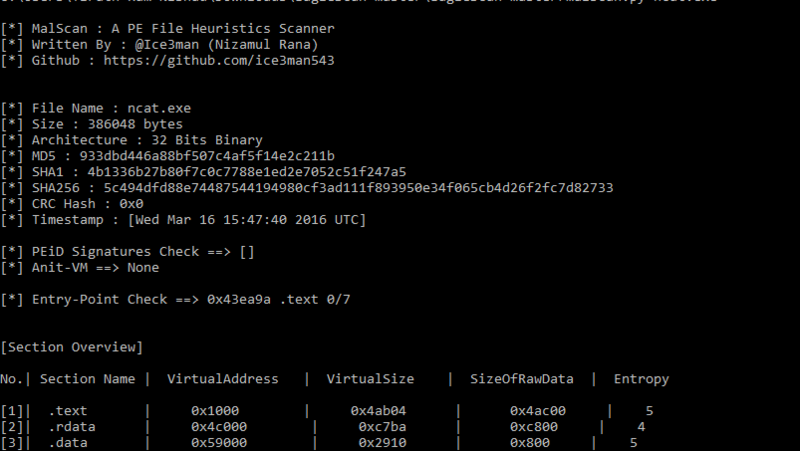 MalScan is a simple PE File Heuristics Scanners written in python that you can use to quickly analyze a PE file and find out whether anything suspicious exists. It is a simple tool so doesn't offers much fancy features. You are free to extend it or do whatever you want with it. You need to have Python 2.7 installed on your machine. The additional requirement is yara-python. Simply run with the name of file you want to check. You can add more featrues or recommend any changes to the existing ones. Any kind of help is appreciated.